In recent years the written records on which the teaching of the First Class is based have been published in German and in English translation. In view of this, and the many questions arising from it, the Council of the Anthroposophical Society at the Goetheanum, Dornach, commissioned Johannes Kiersch to write a history of the institution. 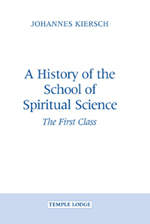 The result is an objective overview of the development of the First Class, from its roots in the early esotericism developed by Rudolf Steiner while he was still in the Theosophical Society, to the period following the Second World War. Kiersch gives an individual commentary on the first "mediators" of the school - individuals like Lili Kolisko, Harry Collison and Count Polzer-Hoditz - and presents some 37 original documents in an extensive Appendix that features personal notes, letters and speeches. This book presents a balanced history of the birth and development of the First Class and its existence during the tragic splits and conflicts following Rudolf Steiner's death. As Kiersch comments: "The aim has been above all to come as close as possible to the sources and offer historical material for individuals to form their own opinion."